By 1968 the exciting, upbeat sounds of Ska and Bluebeat had begun to be replaced in the often-changing musical tapestry of Jamaica by Rock Steady. 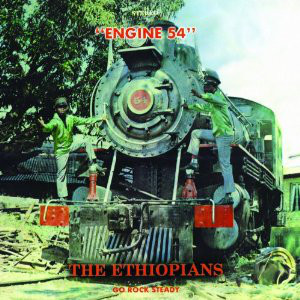 This, The Ethiopians' debut alum, was much more n the Rock Steady genre than ska, although the title track is often considered to be ska, it isn't, really. It is considerably slower. "My Love" is actually a fifties-style rock'n'roll ballad with precious little Rock Steady in it at all, if any. 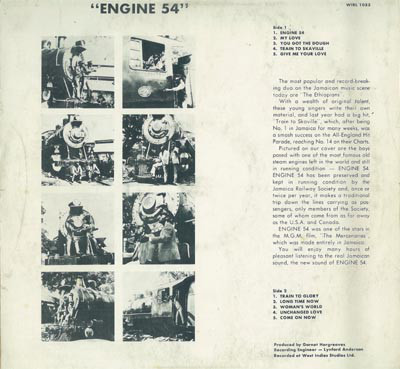 The Ethiopians merged sixties rock/soul with Jamaican rhythms very successfully, and people around the release of this album started to take notice of this type of Jamaican music. Reggae, of course, had yet to be coined as a phrase or a genre. Toots & The Maytals' "Do The Reggay" came out in the same year. That said, listen to "You Got The Dough". It is full of reggae skanking rhythms. It was just that nobody had given it a name. Well, they had I guess - Rock Steady. "Train To Skaville" is classic slow tempo ska, however and it possibly the best known track on the album, dominated by its horn riffs. "Woman's World" is almost calypso and sounds like something from the late fifties. "Train To Glory" was later covered by Bunny Wailer and a variation of "Long Time Now" was done by Johnny Nash. This was a far more influential album than the actual sum of its parts. For an album dating from Jamaica in 1968 the sound quality on the latest Trojan remaster is pretty good. I was born in the late 1950s, into the rock n roll years. My musical taste covers largely the late 50s to the 90s, although there are favourite artists of mine who are still releasing material now, that I still like, of course. My tastes include Rock, Soul, Reggae, Northern Soul, Motown, Blues, Jazz, Folk, Country, Funk, Disco, Glam, World Music, New Wave, Punk, Two Tone. The opinions I express in these reviews are just that, opinions, nothing more, nothing less. If I don't like as album as much as you do, don't hold it against me! Music is all about opinions. I am not writing these reviews to provide information as to who played what, who produced the album, what barcode it has etc. There are many books and bloggers that do that. I am just wishing to express how much I like the albums in question. Sometimes I listen to a song and I just want to write down what I feel about it. Just a personal indulgence. Please feel free to leave comments on the reviews, even if you politely disagree! After spending most of my life in the South of England, attending hundreds of gigs, particularly in the punk era, I now live a quiet life in the Scottish Borders.